Hares. ‘Boxing hares’ -females fending off males by standing upright and striking out with their front paws- are a notable sight in Spring. 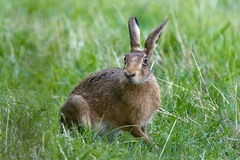 The Brown Hare, found in grasslands, is golden-brown, with a pale belly and a white tail. It is larger and faster than grey-brown Rabbits, with longer powerful legs and larger ears with distinctive black tips. The Mountain Hare is the hare seen on the Barnsley upland moors. It is brown in summer but turns a distinctive white in winter. 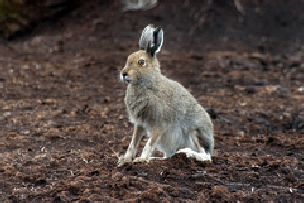 It also has a white tail but its long ears are shorter than those of the Brown Hare with only a slight black tip. They both remain Section 41 species of principal importance under the NERC Act (2006). As such they are both national priority species for Biodiversity 2020. They are Barnsley local priority species because of their national status and the potential for local conservation. 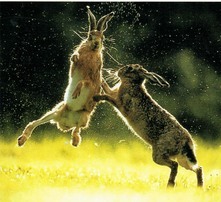 The Brown Hare was introduced into the UK over 2000 years ago replacing the native Mountain Hare, except in Scotland. The Mountain Hares found in Barnsley are the result of introductions on the Peak District moorland in the 19th Century. 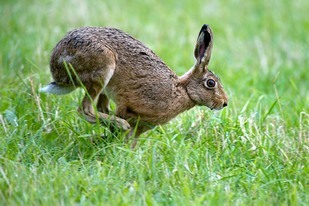 Hares live above ground and do not use burrows. They rest during the day hidden in shallow depressions (forms) in the ground and longer grass. They move out to feed in the open at dusk. When disturbed, they zigzag away at speed. 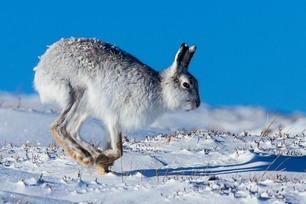 As they run, they tuck their tail down so that the white underside is not visible – unlike Rabbits. More information on the conservation of both Brown and Mountain Hares, their distribution in Barnsley, and an action plan can be found via the following links. Brown Hares breed from February to September and females can have up to four litters of two to four young (called leverets). The breeding season for Mountain Hares is mainly in March to July and they may have fewer and smaller litters depending on the conditions. The young leveret is born fully furred with eyes open and is left by the female in forms. One visit per day is all the young get from birth until they are fully weaned after 3 - 4 weeks. This avoids attracting predators like the Fox. Where Foxes are common there are likely to be few hares.